$550 plus $8 shipping in U.S. 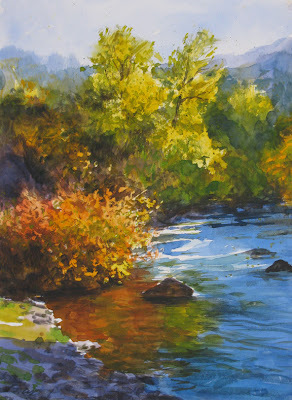 This painting was done as a demo in the watercolor workshop I taught over the weekend. I think the workshop went well--hope everyone felt they got something from it. They were a good group, hard-working but fun-loving too. I meant to get pictures but was just too busy. I was at your studio yesterday to check the drying of my painting and saw this lovely painting. It just sparkles! Beautifully done. I hope you had fun teaching the workshop. Wow! That's the first thought that came to mind when I saw this painting. I love your use of color and light. Thanks Victor--I appreciate your visit and encouragement. Hi Katherine--thanks a lot. The workshop went well, I think. Hi Sheryl--thanks for those nice thoughts. I love the nice rich colors in this piece...well done! Thanks Jean--good to hear from you. Really great use of watercolor. Such command of the light.